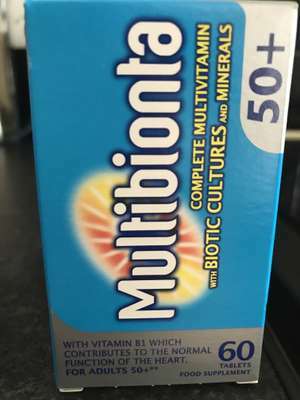 60 pack of Multibionta 50+ complete Multivitamins only £1 in Poundland. £11.99 in Boots. Has anyone else spotted these? Wow hope theyve got these in mine next week when i go, total bargain!! Cold... Save your ££. Contains SOOOOO much junk fillers and binders. B12 is listed as cyanocobalamin, very hard to absorb. If your going to take multivitamins, try to buy quality wholefood state. Obviously, always better to get your nutrients from real foods. Lots of then in Bristol city centre. But it is short expire, Feb 2019, so be careful. Lots of then in Bristol city centre. But it is short expire, Feb 2019, so …Lots of then in Bristol city centre. But it is short expire, Feb 2019, so be careful. There are 60 tablets in a pack so they’ll be finished long before they expire. There are 60 tablets in a pack so they’ll be finished long before they e …There are 60 tablets in a pack so they’ll be finished long before they expire. Well you’ve got even more of a bargain then ....and they’ll still be in date!